Fall Creek Falls State Park naturalist Stuart Carroll walks out of Lost Creek Falls cave. The cave was donated to the park by James Rylander and contains about seven miles of passages and five entrances. The park is working to create a management system for the cave now that the acquisition of the cave is being made known to the public. PIKEVILLE, Tenn. - Visitors flock to Fall Creek Falls State Park to see waterfalls, including the park's namesake which, at 256 feet, is one of the tallest cascades east of the Rocky Mountains. While the general public may not know it -- and the official park brochure doesn't mention a word about it -- the park's 25,000 acres are riddled with caves that lure spelunkers from far and wide. "Fall Creek Falls has more caves than any park in the eastern U.S. -- except for Mammoth Cave [National Park]," said Stuart Carroll, a naturalist and interpretive specialist at the state park's nature center. "We've got some big caves here." The park recently scored again in the cave and waterfall category. It picked up Lost Creek Falls and Lost Creek Cave -- natural features so stunning that Disney used them to film scenes for "The Jungle Book," its 1994 live-action version of the Rudyard Kipling classic. The estate of the late James Rylander gave the park system the cave and waterfall, which are on a 200-acre property that Rylander, of Americus, Ga., owned northwest of the park's boundary. "We are particularly thankful to the Rylander family for all of their hard work and for their vision to protect the property," Tennessee Deputy Commissioner for Parks and Conservation Brock Hill stated. Lost Creek comes out of a cave, travels a short distance across a sandstone capstone, and then drops some 60 feet into a plunge pool -- one that doesn't seem to lead anywhere. The rushing water disappears into crevices. "Hence the name 'Lost Creek,'" Carroll said. "I've never seen it dried up," he said. The plunge pool is nestled at the bottom of a deep, wide, bowl-shaped depression called a sinkhole, or sink. On the other side of the sink, across from the waterfall, lies a large entrance to the cave -- one of five entrances to its seven miles of passageways. Moist air emanating from the cave's mouth was cool enough on a warm day this week to turn visitors' breath into steam. The cave's light-hued limestone curves overhead, giving the entrance the feel of an underground amphitheater. Huge boulders that "calved" off the ceiling ages ago stand on the cave floor. From a little ways inside, a visitor can look back and see forest framed by the entrance. Compared to the state park's other caves, Carroll said, "This is by far the prettiest cave entrance that we have." Rylander died in January 2011, and it took a while for his bequest to work its way through probate court. The state park took final possession of the Lost Creek property only about two weeks ago. Now, park officials have to decide how best to manage the site. The 200 acres likely will be kept in a natural, unimproved state, they said. 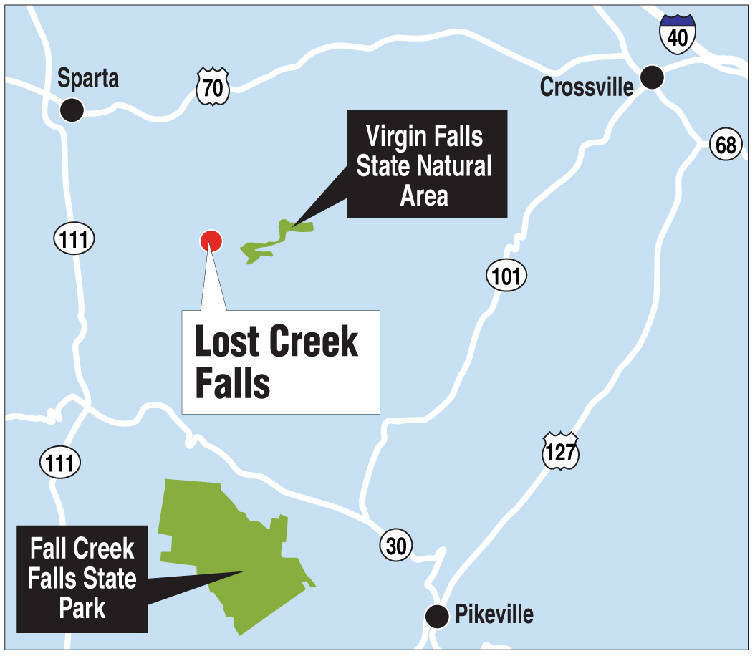 A hiking trail may be built to link the Lost Creek Falls area to the nearby Virgin Falls State Natural Area. One big question is how to manage Lost Creek Cave, also known as Ben White Cave or Dodson Cave. American Indian artifacts have been found in the cave, including pottery shards and fragments of torches, Carroll said. Lost Creek Cave is known to contain 11 globally rare species, primarily cave invertebrates and one federally listed mammal species, state parks spokeswoman Meg Lockhart said. 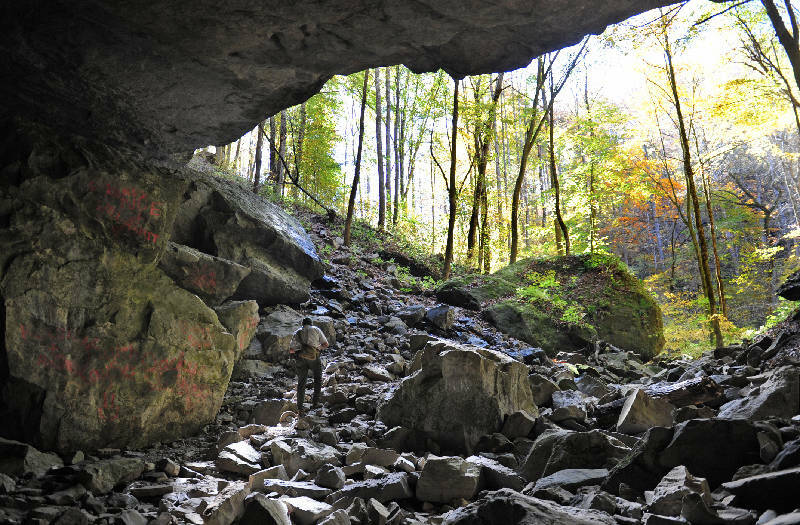 "It's one of the best-known recreational caves in Tennessee," Carroll said. Even though the cave was on private property, Rylander didn't try to keep spelunkers away -- though he didn't encourage them, either, Carroll said. "It was sort of 'hear no evil, see no evil,'" he said. The cave has suffered some abuse in the form of littering and graffiti. People have set off fireworks inside it, Carroll said, and made fires -- the smoke from which can irritate hibernating bats. The caving community uses the phrase "sacrifice cave," Carroll said, to describe caves that have been trashed through overuse. "This cave is not a sacrifice cave," Carroll said. "It does have resources, both natural and cultural." While Fall Creek Falls State Park has lots of caves, it doesn't promote them -- partly because of concerns about inexperienced visitors grabbing flashlights and heading off to injure themselves underground. "We don't really advertise them," Carroll said. "Our staff has been instructed not to give directions to caves." The spelunking community explored the park's caverns anyway -- until 2009, when the state park system closed its caves to the public because of concern about white-nose syndrome, a generally fatal disease that's decimated bat populations. The caverns are off-limits in case cavers' clothes pick up spores that cause the fungal disease and spread them from cave to cave. Buddy Lane, a board member of the Chattanooga-based Southeastern Cave Conservancy, is glad that the state was given Lost Creek Cave. "I think it's a good thing they've got it, and it doesn't look to me like they're going to close it," Lane said. "They've already found [white-nose syndrome] in that cave; it's already there," Lane said. The best strategy, he said, would be to keep the cave open and require cavers to follow protocols to clean their clothes and equipment so it doesn't spread spores. Carroll anticipates Lost Creek Cave will maintain some sort of access for cavers. "They bring a lot of resources to the table," he said, explaining park personnel call on the expertise of the caving community for things such as difficult rescues of injured cavers. "I don't think it was Mr. Rylander's intention for us to get the cave and the next day close it," Carroll said.